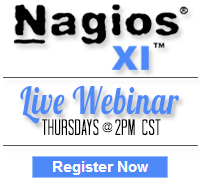 We have now released a CentOS 6 version of Nagios XI in the Amazon Ec2 for cloud monitoring. The new release is build on the x86_64 architecture and will be the standard for future builds. In case you missed the announcement from Amazon, all instance sized can now be spun up with 64 bit images. This is a great step forward as it allows someone to start with a small instance at a much reduced price and as they grow they can take their same snapshot an start it up on a much larger system. More information about running your Nagios XI system in the cloud can be found in our Nagios on Ec2 article in the Nagios Exchange. Category: Deployment, Distributed Monitoring and Nagios XI. Closed Tags: amazon, cloud, cloud monitoring, ec2, nagios xi.